Knowledge for Change is an international charity, hosted by the University of Salford, that provides highly educational elective placements and training opportunities in healthcare sectors in developing countries. Driven by our strong focus on ethics and sustainability, all placements aim to facilitate a mutual exchange of knowledge, skills and expertise. This way, while having a valuable and unforgettable experience, students are able to engage in and contribute to meaningful, interesting and ongoing projects aimed at making sustainable improvements to some of the most poorly resourced healthcare systems in the world. 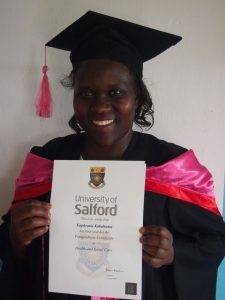 This week three Ugandan healthcare professionals are arriving at the University of Salford on the Commonwealth Professional Fellowship programme. This is Euphrasia, our previous colleague, who has returned and made a profound impact. The health centre she works in (Kagote) had not delivered a baby for 16 years and it is now the best performing health centre in the District with deliveries increasing all the time. Euphrasia is now able to contribute to teaching on their new midwifery degree supported by our charity and Salford staff. And now we are embarking on supporting another failing health centre. Kagote is the facility we choose to place Salford midwifery students in on placement so they get great support. If you are going over there look out for her smiling face! Find out more about Knowledge4Change & University of Salford Knowledge and Place projects. 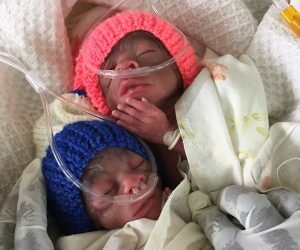 The twins pictured (boy and girl) were born at Bakuuku Health Centre Four (HCIV), Fort Portal, Uganda. Bakuuku HCIV is staffed by Knowledge for Change (Knowledge and Place) which places volunteers (including University of Salford Nurses and midwives) for capacity development purposes. Unfortunately one of the twins (girl) died due to power cut that supported their oxygen supply. The surviving twin boy is now cared for by a number of volunteers including Salford University student nurses and midwives. This case highlights health care challenges in low income countries and how professional volunteers can help support local capacities. Prof Louise Ackers has recently been awarded £1,500 worth of books by British Medical Journal. 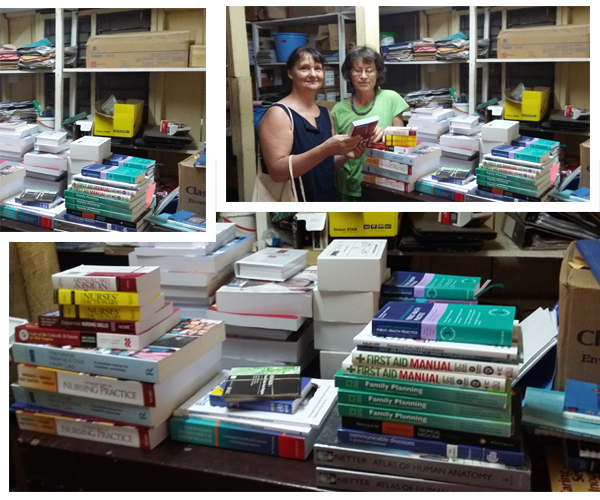 The books are now at Mountains of the Moon University (MMU) at Fort Portal, Uganda. This donation (applied on behalf of MMU) by Professor Louise Ackers will be used by thousands of undergraduate and postgraduate students at MMU. Funding to reduce maternal and newborn mortality in Uganda.. 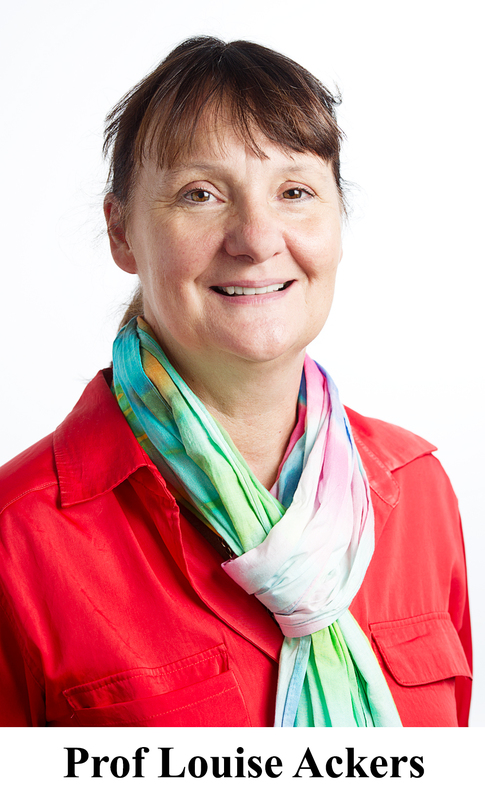 Professor Louise Ackers, from School of Nursing, Midwifery, Social Work and Social Science, Salford University has just received news of funding from the Tropical Health Education Trust (THET) for 2 projects focused on reducing maternal and newborn mortality in Uganda. The ‘Reducing Infection through improvements in Hand Hygiene’ is focused on the development of a social enterprise in the local production of hand gel, linking Mountains of the Moon and Salford University social work students. The award of £27,650 will support this partnership. Professor Ackers will lead the first wave of Salford undergraduates commencing placements in Uganda this week. A total of 35 Salford students from a wide range of disciplinary backgrounds including nursing, midwifery, social policy, prosthetics, orthotics, podiatry, physiotherapy, social work and integrated professional practice will experience placements in Uganda this summer.